ISBN stands for International Standard Book Number. It's a unique identifier, which means that every book has its own ISBN that is not repeated for any other book. This allows associating all basic details about a book with its ISBN. Being a numeric value, ISBN can also be associated with another numeric property of a product, bar code. In fact, since 2007, ISBNs contain 13 digits and are directly compatible with EAN-13 bar codes. The first numeric book identifier was suggested in 1965 in the United Kingdom and contained 9 digits. Upon it, International Standard Organization (ISO) developed the 10-digit ISBN format. ISBN was published as international standard ISO 2108 in 1970. ISBN is compatible with the 9-digit SBN identifier used in the United Kingdom until 1974. ISBN is assigned to every edition of every published book (reprintings have the same ISBN as the original circulation), including ebooks. This is done by special agencies that manage ISBNs for the given country. In some countries, ISBNs are issued at no cost, while in other countries, a payment is required. For example, in the USA, a single ISBN may cost about $125. 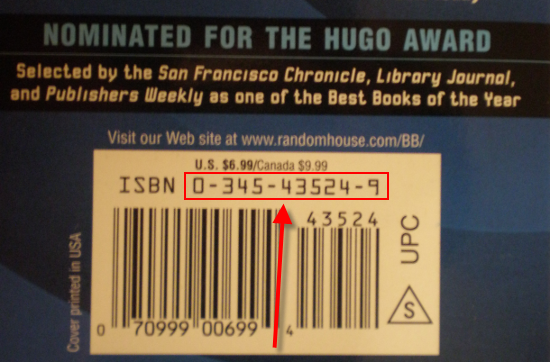 In Canada, ISBNs are issued for free. ISBN is a great means of cataloging books. It is widely used in all sorts of libraries to identify and manage books. You can also search for books using their ISBN numbers at such online stores as amazon.com. Booknizer is capable of adding books by their ISBNs. Just use the "By barcode/ISBN" option in the "Add book" dialog and enter one or several ISBNs. The book organizer will immediately download some basic information about the books, displaying their covers, titles, authors, and some other details directly in the list. After this, click "Next" to download more information about the books. If you use the Amazon.com script to download information, Booknizer will automatically download additional information for all books that you add by ISBN. If a different script is used, you may need to select titles from search results manually. This happens for sites that do not support search by ISBN. It is possible to skip downloading additional information, saving the already downloaded details into the database. To do so, disable the "Download information about the book from the internet" option at the bottom of the "Add book" window. For periodical publications (magazines), a different standard numeric identifier is used, ISSN (International Standard Serial Number).